Rollin' down the river with Proud Mary and her krazy krewe! : Halloween photo shoot! Today Clint went to the NICU early and I went later in the afternoon with Monique and my mom. It is always good to have visitors, it means a lot when people come with us to see Liam. I think in a way people are scared or nervous to come see him but as long as you are well and sick free, please ask us to come visit! 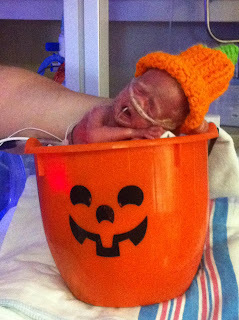 Anyway, since it was the day before Halloween all of the nurses had on some cute little witch hats and everyone was in the spirit of the holiday. I dropped off some yummy petit fours for the nurses as a yummy treat. The nurses were doing little photo shoots with all the babies! I wasn't sure if Liam would be able to participate as he is much smaller than all of the babies there currently. 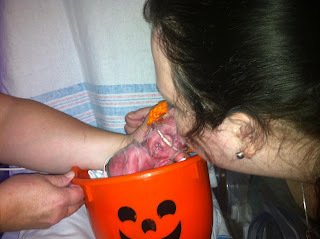 The bigger babies were so cute stuffed in that little bucket with mini candies all around them! They asked if I wanted to hold Liam, so we cuddled for quite a while. My mom was in there and I could tell she was getting very emotional. This was the first time she has seen Liam be out of his isolette and the first time she saw me holding him. I could tell at times she was about to cry, which then made me very emotional! My mom was VERY nervous. When you aren't used to it (and I wasn't either the first few visits) the monitors beep constantly. Some beeps are of course serious but more often than not they aren't anything to be nervous about. For example, when the isolette is left open when I'm holding him it beeps every few minutes saying "baby cold" b/c it's left open...but nothing is wrong. After a few beeps my mom started asking for nurses to come and help because she thought poor Liam was in danger. Don't fear, nothing was wrong it was just the beep from the isolette being open. My mom is a worried grandma for sure! The nurses asked if I wanted Liam to have his picture taken in the bucket for Halloween. At first I said no but he was tolerating being held so I said why not. I'm so thankful I did because check out his adorable photo shoot! I'm so glad I was there at that time to take pictures with Liam for his 1st Halloween pictures! One of the nurses is so funny, she started measuring mini snickers on the scale to see how many snickers make a Liam! It was making me giggle. All of the nurses are just so great, encouraging and supportive in the NICU. While I was driving home with my mom she started crying. I can't see my mom cry about Liam without being choked up myself, so usually I say "stop it mom, please don't make me cry!". It made me realize how much of a roller coaster this has been for her knowing that her baby (me) has been through so much and her lucky no.7 grandchild. I can't wait to look back on this NICU journey and hopefully say the time flew by and cry happy tears with her. Hopefully it's sooner than later!